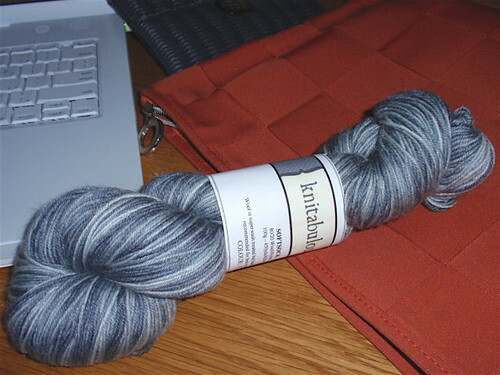 It's a skein of sock yarn dyed by Knitabulous in a great combination of greys, punningly named 'Foxymoron'. I'd been very disappointed to miss out on acquiring this when it was posted in Knitabulous' shop, which doubled the pleasure of Fee's thoughtful gift. I'm not even planning what to do with it. I'm just gloating for a while. And being grateful for friends in times of unavoidable emotional stress. Autumn in Sydney is perfect. Lots of sun and blue skies, and even when it rains, as it has this last week, it's a thorough cleansing that leaves the city sparkling. It's (just) cold enough to wear woolly knitted scarves and hats and and to snuggle into a doona to sleep. Then there's the succession of events that builds a sense of such pleasurable expectation. The Sydney Film Festival is in early June - ten days of compressed film viewing that's a mixture of great films and bizarre and unpredictable views of the world. I always feel it allows me to 'get my eye in' for viewing films for the following year. In the midst of the film festival is World Wide Knit in Public Day with its opportunities to catch up with knitting friends and meet fellow Ravellers and knitting bloggers who have so far been names, rather than faces. Then in early to mid July there's the Tour de France cycling race - broadcast live in Australia at times that make you wilt by the end of the tour, simply through viewing it. Last year I participated very productively in an international Tour de France Knit-a-long that was great fun. I'm not sure if there will be a repeat of the KAL this year, but even if there's not I've decided to do a personal Knit-a-long and make Eunny Jang's Tangled Yoke cardi for my daughter. And this year I'm planning to go to the Byron Bay Writers Festival in early August. I will combine it with a visit to friends in the area and stay with an old and good friend who lives just south of Byron Bay. So, my tasks of the last few days and for the next week or so are reviewing patterns, yarns and schedules and thinking about how my knitting can fit around, or possibly be combined with these pleasures. 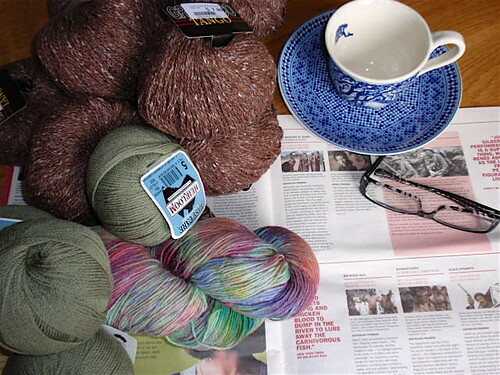 I'm a bit behind with my self-imposed knitting schedule for the year, so I need to do some reorganising and resetting of knitting priorities. I guess it's the same kind of pleasure that potters get from making the same kind of pot over and over again, or that poets get from writing sonnets - or, to be less aspiring, limerick writers get from writing limericks. It's the delight of repeating basic and simple forms, but inserting decorative changes. I've 'borrowed' Mustaa Villaa's recipe, and used some old Patons' Totem from my stock of wool, with odds and ends (roughly DK weight and doubled sock yarn ends) for the garter stitch border. It's very simple, but a perfect hat. The garter stitch edge is knitted on smallish needles for the thickness of the wool and makes a wonderfully warm covering over the ears. The hat is deep enough to come fashionably low around the face. 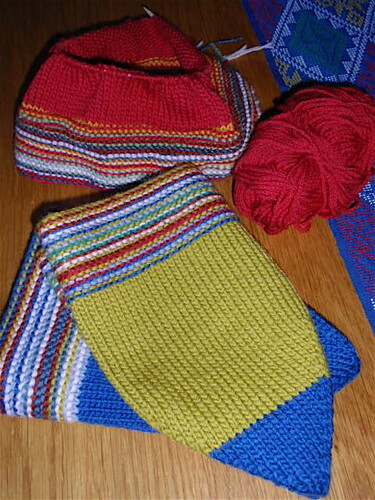 I'd decided to knit the hats for the Winterwarm charity, coordinated in Sydney by PomPom. But the mustard coloured one has already gone astray. Inadvertently, I've knitted something 'cool', and my son has been wearing it constantly. I guess I'll just have to knit more of the hats. Forgetting simply does not work. Wishful amnesia is no protection against memories of actual, lived experience. The events of the past rarely pass. They leave marks in documents, in bodies, in communities and places, in buildings, streets and landscape. I've blogged before about where I feel at home, and why. I'm now a dedicated city person; but I grew up inland, and the landscapes of inland NSW still tug at my heart. I know the shape and feel of small country towns and I appreciate the generations of work and hardship, as well as community-building, that went into shaping them. On my recent road trip I was particularly aware of the efforts that are being made to preserve, sensitively, marks of the ebb and flow of white settlement over the last two centuries. The trick is to do this in ways that don't undermine recognition of ancient Aboriginal ownership. 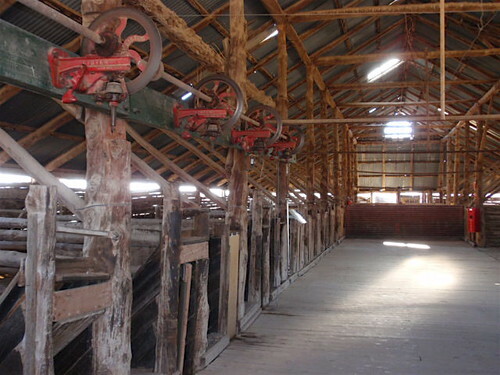 The shearing shed (1870) on Mungo station, on the western edge of Lake Mungo. The pastoral lease on Mungo station lasted from the 1860s through to the 1960s - mostly in the same family. The ultimate futility of trying to graze this country is very evident in these dry times, but nevertheless, you marvel at the persevering spirit of those who braved the isolation and hardship of farming this land. 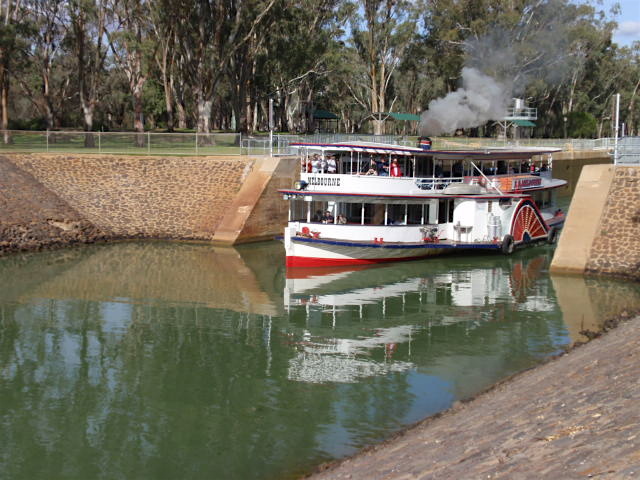 The paddle steamers at Echuca and the old gaol at Wentworth. In different ways, these both mark the period from about 1870 to 1910 when the river trade on the Murray, Darling and Murrumbidgee Rivers was vital to the pastoral industry and trade in south-east Australia. 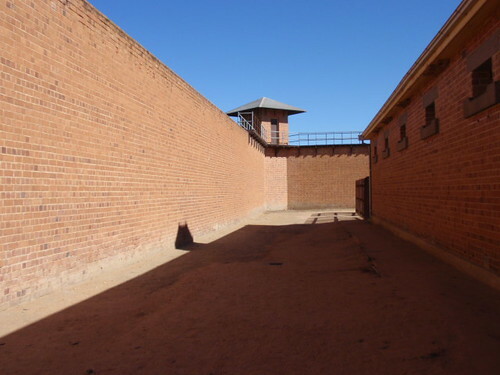 The gaol at Wentworth, at the confluence of the Darling and Murray Rivers, was built to deal with the population boom of frequently law-offending riverboat men, dock-workers, shearers and itinerant laborers who were attracted by the port. By 1920, when railways supplanted the riverboats and the population shifted to towns served by the railways, the riverboats were largely abandoned and the gaol was closed for lack of prisoners. The gaol at Wentworth had cells for both men and women. According to the story told there, most of the women prisoners were members of the Salvation Army, who, in the late nineteenth century were regarded as members of a dangerous sect, often disturbing the peace by speaking in public of many of the evils of Wentworthian behaviour. 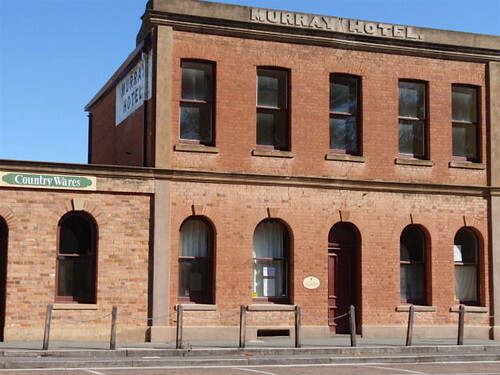 I love the mellow red brick used in this old pub in Echuca and in so many of the late nineteenth century buildings (including the Wentworth gaol) in these river regions. 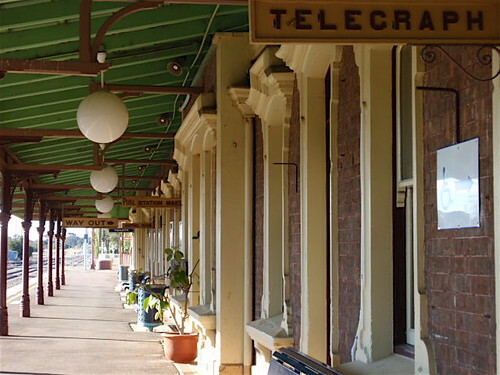 Not only the station, but the associated railway buildings around the entrance square are in the elegant Italianate style often used for railway buildings. Nowadays, when beautiful public buildings such as post offices and banks are being sold off willy nilly, it's interesting to register the level of pride that was once taken in these lovely public spaces. The railway station at Hay, by the way, has an amateur but moving museum to Hay's role as an internment and POW centre during the Second World War, when the population of this isolated town doubled because of the camps. 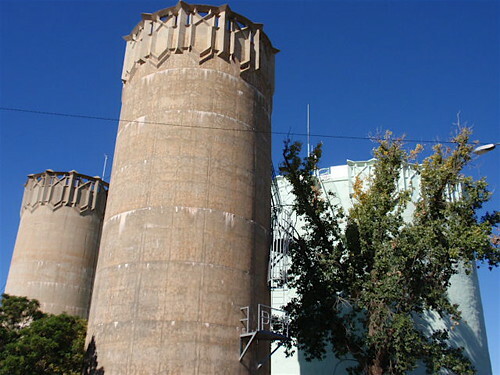 We had a bit of a diversion from the rivers to visit Leeton and Griffith - towns that were newly built in the 1920s within the Murrumbidgee Irrigation Area. They were created at a time when irrigation was seen as the miraculous greening of a barren Australia - before the damage from salinity and the limits to the water supply were realised. I was newly surprised to be reminded that these two towns, with their circular street layouts, were designed by Walter Burley Griffin - the designer of Canberra. They are so different from the nineteenth century colonial towns. 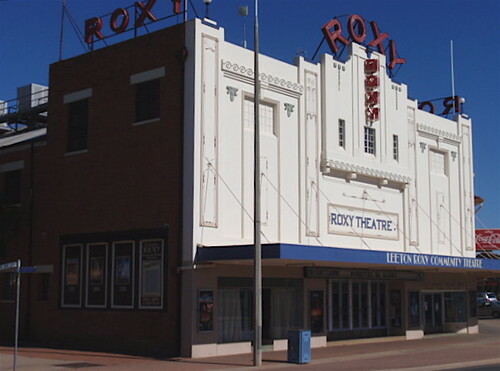 They have moved away from the typical grid layout and their public buildings are in art deco style, as is the remarkable (and still surviving) Roxy Theatre in Leeton (1929). Perhaps even more remarkable is that for the first decade or so of their existence alcohol was prohibited! 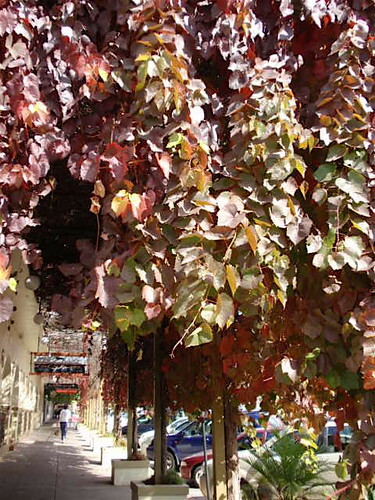 And finally, a modern-day colonnade in Mildura, roofed with autumn-toned vines. You probably can't quite see one of the signs in the colonnade, but it reads 'Stefano's'. Yes, we did have a superb five course dinner at Stefano de Pieri's restaurant - fresh produce, perfectly prepared and elegantly restrained. Finding the marks of our past and present lives in buildings and streets is the perfect focus for a local holiday. 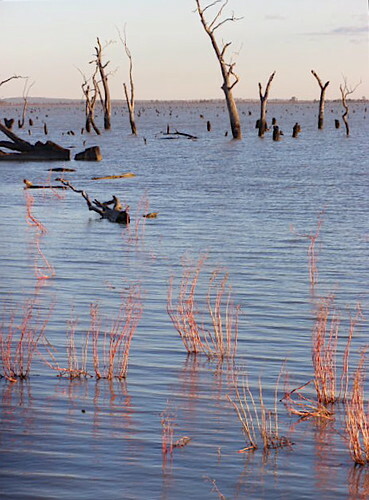 While away in the Murrumbidgee-Murray region we not only marvelled at the rivers, but also at the lakes - or rather, at landscapes that were, once upon a time, lakes. The highest of many high points in our holiday was a couple of days spent in Lake Mungo National Park, about 90k north-east of Mildura. 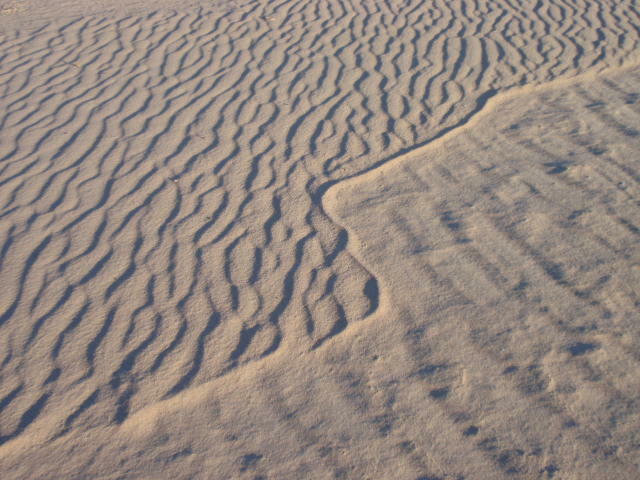 Timescales are almost irrelevant in discussing Lake Mungo, but as the units of counting are in the tens of thousands, you care only that it's a very ancient landscape. 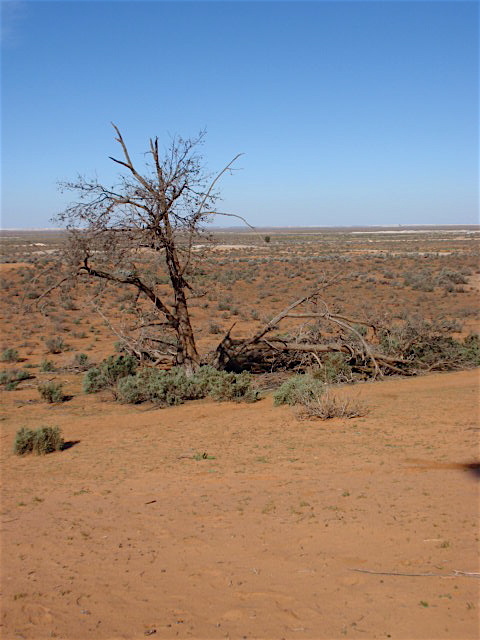 Evidence of Aboriginal occupation of the area - fire sites, fish bones, mussel shells, tools - goes back at least 40,000 years, and the skeletons of Mungo woman (discovered 1969)and Mungo man (1974) are dated variously between 25,000 and 60,000 years ago. As the Lake disappeared and the soil dried, westerly winds built up rock and sand formations on the eastern side of the Lake to form lunettes (what a lovely word) - crescent shapes formed by the winds. These lunettes are a stunning feature of the landscape. You can just see them as a white line on the horizon of the photo above (possibly you need to be short-sighted!). The lunettes are now called the Walls of China. One story goes that the Chinese pastoral workers working at Mungo (then a pastoral lease on the western edge of the non-Lake) in the late nineteenth century thought the distant wall of rock and sand resembled the Great Wall of China. 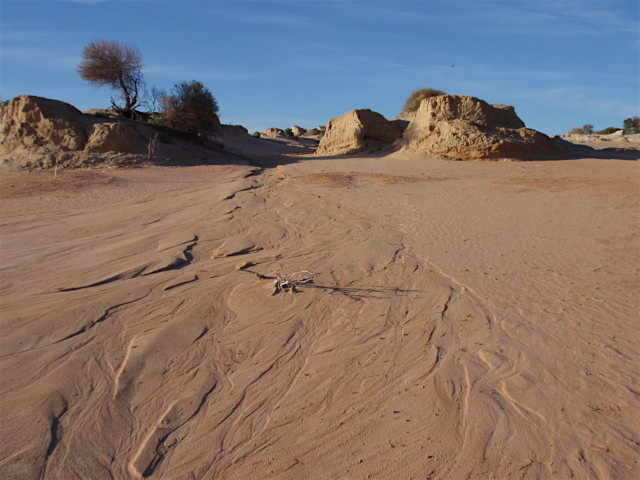 While its magnificence was unchallenged, Lake Mungo was not our only awe-inspiring experience of ancient landscape. About 10k outside Wentworth we found the little-publicised Perry sandhills. (Well, we found them after losing ourselves, but that happened rather frequently on our trip). 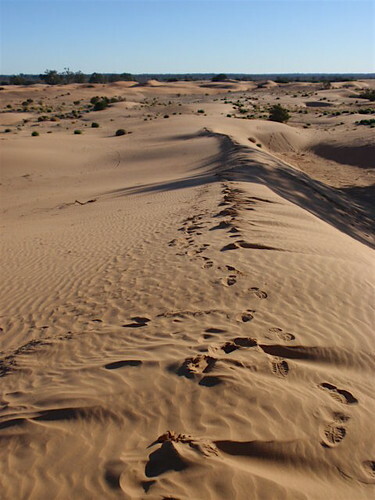 These sandhills are golden-red, unlike the white sandhills of the Walls of China, but also date from around 40,000 years ago, with ancient evidence of the mega-fauna that inhabited Lake Mungo as well as this area. 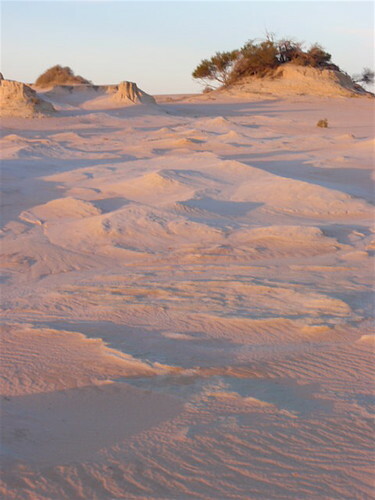 Unlike Lake Mungo, where visitors are somewhat reverent in the presence of of such natural grandeur, the Perry Sandhills are a play and picnic ground for local people. When we were there two young boys were sliding down its not so pristine but steep slopes on pieces of cardboard. We were also told a number of times that they are much in demand as a desert locale for a variety of films and advertisements! Our final encounter with ancient landscapes was much more serendipitous. In fact, I didn't even know it was an 'ancient landscape' until I returned home and googled it. 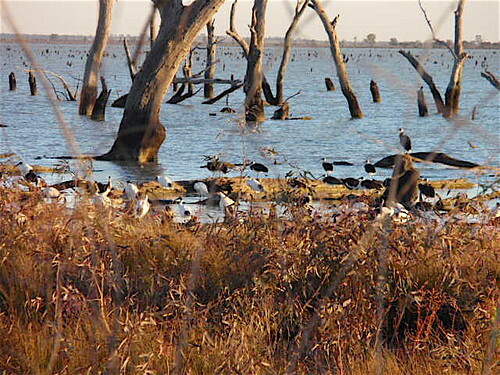 As you drive east between Swan Hill and Echuca there are a number of lakes to the south of the road (these ones have water). There was a sign to Kow Swamp, and intrigued by the blunt inelegance of the name and attracted by its proximity, we turned off the main road to investigate. Of course we took the long way round yet again, but eventually came upon the swamp - hectares of water with marshy edges, a sulphurish smell, and dead trees protruding across its surface. But it was crowded with birds, particularly a species of heron, and in the late afternoon light the stems of some reed-like growths glowed red. I've since discovered that this is yet another site for archeological excavation, where the bones of a group of around forty individuals - possibly dating from 20,000 years ago, have been unearthed. I still don't know why it is called 'Kow Swamp' but its significance in my memory has been enhanced beyond its somewhat creepy beauty. Next (and final) episode - the built environment! 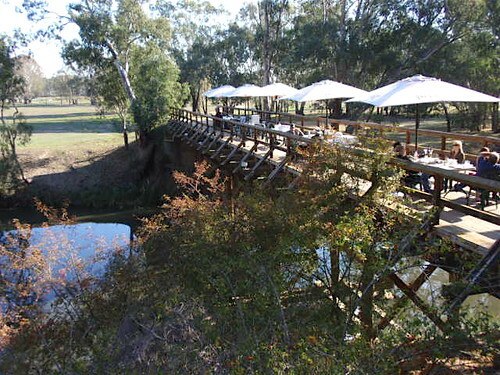 Everybody should plan a trip to the Murrumbidgee-Murray region of NSW and Victoria. I've just had a perfect holiday, where day after day revealed beautiful landscapes, evidence of long indigenous ownership of the land, and engaging and touching histories of the white settlement of Australia. I'm having problems organising my thoughts about it all and giving any coherence to my blogging. For better or for worse I've decided to focus this entry on the river landscapes we experienced. were constant themes in our travels. 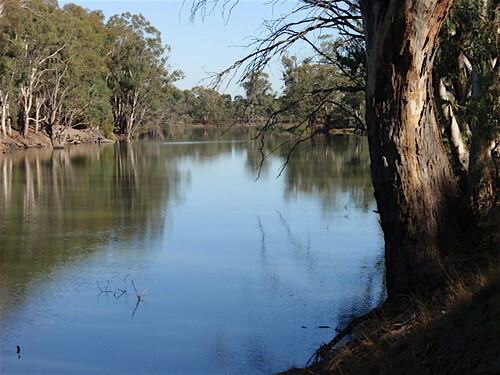 We met up with the Murrumbidgee at Narrandera, where I had taught for two years in the mid 1960s. [I was astonished at how unfamiliar the town seemed. Even though it's more than 40 years ago, I'm amazed that the physical setting of such a formative period of my life has left so few impressions]. We spent a night at a bed and breakfast place bordering the Murrumbidgee in Hay and had a wonderful morning walk along its banks - where we saw innumerable unidentifiable (to us) small and large birds, parrots of various kinds, black swans, ducks, and kangaroos. 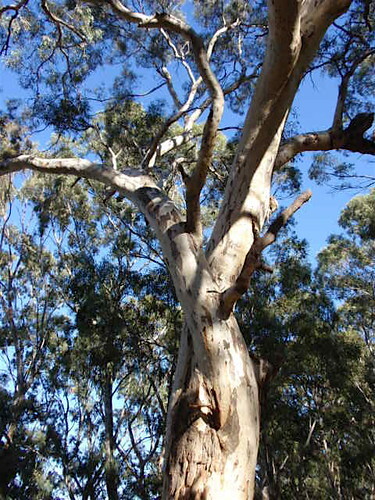 It must have been a place of such plenty for the Aboriginal people who lived there before white settlement, with fish and shellfish from the river, fruit and bark from trees and bushes and plentiful wildlife for hunting. Their spirits are still present. Further on, there was a peaceful walk to the confluence of the Darling and Murray Rivers at Wentworth. Both rivers are full and majestic, though by this point they are so filtered through weirs that it's difficult to judge what the 'natural' level of the rivers is. Just knowing you are at the meeting of these two long and significant rivers gives a thrill (or perhaps my friend Jan and I are still victims of our deeply embedded 1950s primary school social studies curriculum). 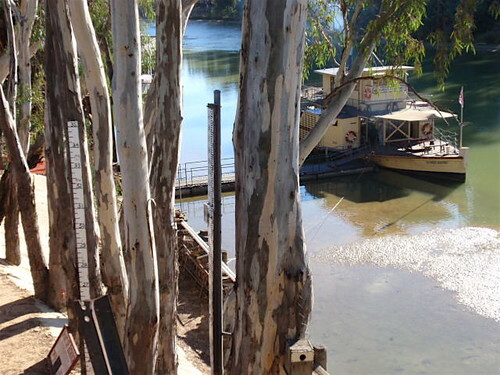 and at Echuca the river was dominated (in the most picturesque way) by its significant role as a late nineteenth century river port. 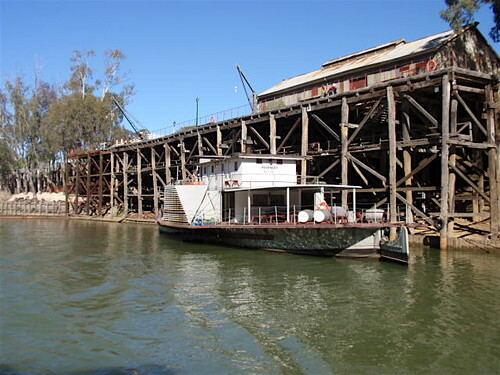 Now, of course, the riverboats are a tourist attraction only, but they are tangible evidence of their brief period of glory in Australia's agricultural and transportation history. At Rutherglen, our final contact with the rivers, the role the Murray and its tributaries play in enabling irrigation for farming - and most particularly vinyards and their pleasures - was evident. Very beautiful and seductive, but the sense of Aboriginal habitation of the land was, rather sadly, much more tenuous. And a knitting footnote... Jane was most perceptive with her comment that you never complete as much knitting on holidays as you anticipate. I did take the materials for the hat and finished it. The grey kimono jacket knitting is still unfinished, though I made significant progress. The Personal Sock Club socks weren't even removed from their project bag. Hmmm. I'm on holiday for the next ten days or so. 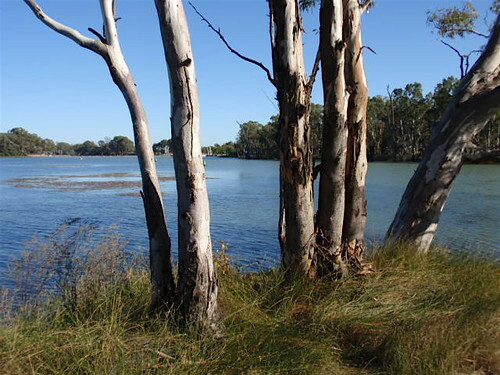 My travelling friend Jan and I have decided to take a road trip west to Mildura - making our way westward along stretches of the Murrumbidgee River and returning along the Murray River. We have some plans, but they're the kind of plans that can be changed if we are diverted by alternative attractions. Our travelling has a history of diversions. 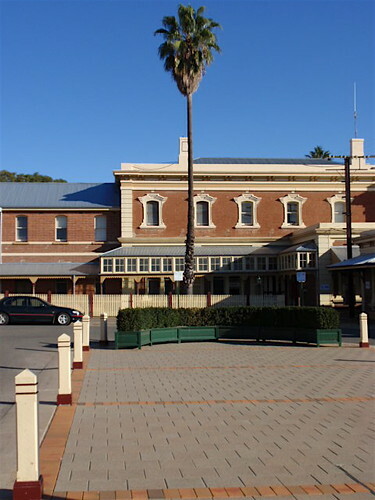 At this stage our road map includes some or all of Narrandera, where I spent two years in the late 60s as a very beginning school teacher; Hay, where we're fascinated by the history of its POW and internment camps; Mildura itself - including a visit to Stefano di Pieri's restaurant; Wentworth with its old gaol and the Murray-Darling confluence (we're a bit taken by confluences); Mungo National Park with the Walls of China rock formations and evidence of very ancient settlement; Echuca and its riverboats; and Rutherglen's food and wine experiences. Let's see what we manage. I suspect we'll get diverted, but we're very experienced at sacrificing some destinations for others with which we unexpectedly fall in love. I've had little difficulty deciding on which clothes to take, but I've still not made an (absolutely) final decision about the knitting. 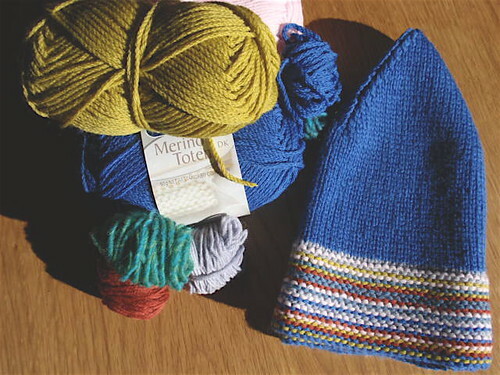 Two projects are definite - my current Personal Sock Club project - Nancy Bush's 'Country Socks', and the 'Indigo Noragi' kimono jacket from Vicki Square's 'Knit Kimono'. The grey merino/silk kimono was begun more than a year ago, and my knitting program for 2009 schedules me to finish it by 7 May - Thursday next week. I have no chance of meeting this deadline as it entails quite a lot of blocking and finishing that is absolutely impossible while travelling; but I am planning to finish the knitting by my scheduled deadline. To achieve this, I have to apply myself in a strong, single-minded fashion. That all sounds very sensible and organised. 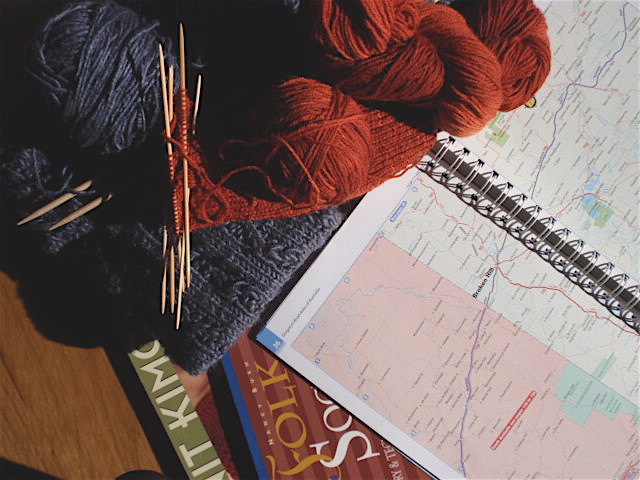 But as with travelling, so with knitting. I've been diverted. I've just finished knitting a very simple beanie (ravelry link) and I want to knit another one in a different colour. The hat's knitted according to the wonderful Mustaa Villaa's recipe and is destined (along with any others I manage to knit) for Sally's Winterwarm charity knitting. I'm not sure if I'll be able to blog while I'm on my road trip, but at some stage I'll report on my travels, bore you with photos, and let you know what happened with my knitting.